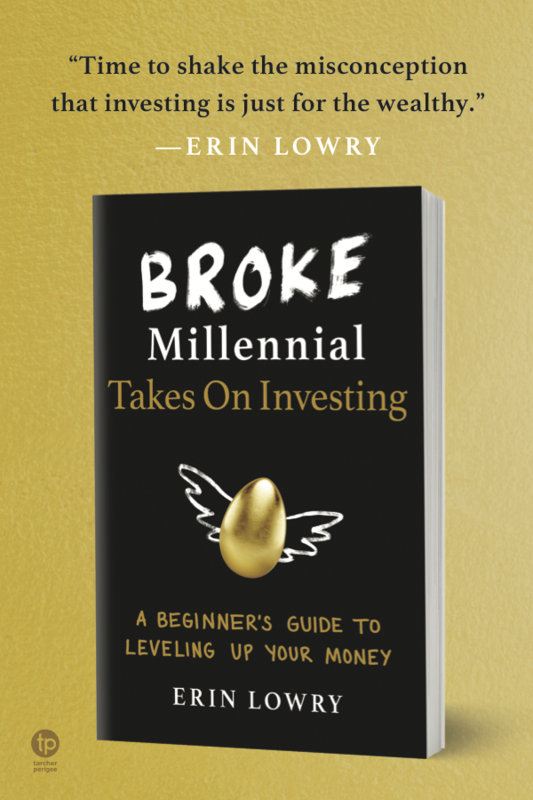 If you caught last week’s Frugal Find you have a good grasp on how passionately I feel about Amazon Prime and all of it’s free two-day shipping, TV show streaming, ebooks library glory. 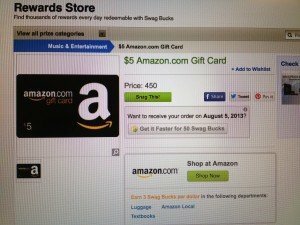 So you probably could sense the extreme jealousy I felt when I started seeing tweets about folks scoring $5 Amazon gift cards from some mysterious site called Swagbucks. Naturally, I put that journalism degree of mine to good use and I started to do some investigating. Like any other savvy millennial, I opened up Google and typed in Swagbucks. After a quick sign up process, where I refused to sync my Facebook with the site because data mining creeps me out, I entered the strange land of Swagbucks. My experience with the site so far is akin with being handed a Gameboy for the first time. I just started hitting buttons and magically earned points. 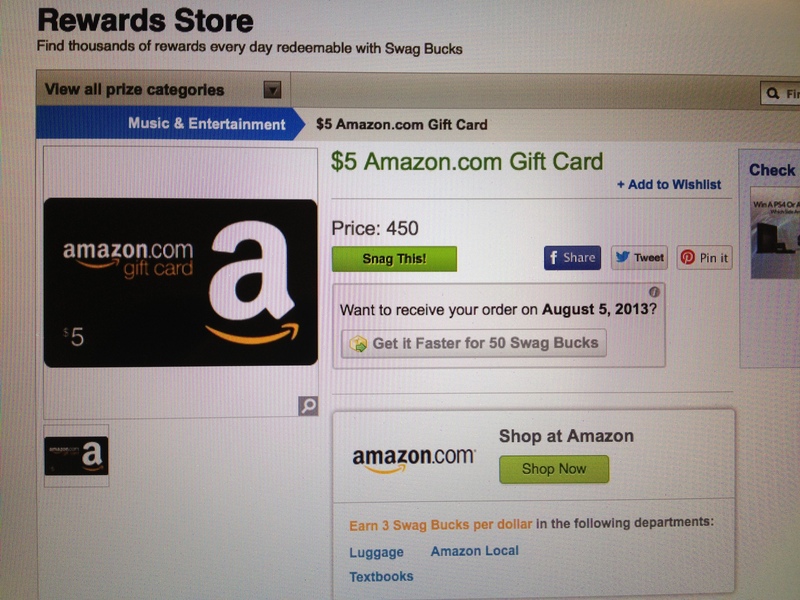 By using Swagbucks, in a variety of ways, you can earn points (or Swagbucks) which are cashed in for rewards. A $5 Amazon gift card costs 450 “SB” and $25 to Target will run you 2,500. The quickest ways to earn Swagbucks is by referring people to sign up or going through the site to shop online. Right now, if you click on Old Navy through Swagbucks you can earn two points for each dollar you spend in Old Navy’s online store. However, if you’re an avid Amazon shopper you can’t pick up Swagbucks for everything you buy. At the moment you can only earn points from shopping for either luggage, textbooks or local deals on Amazon. After a few clicks on the homepage I stumbled into the land of “Watch” and discovered my “get Swagbucks quick” scheme! They give you points for watching clips of popular shows, news highlights, interviews and even music videos. I’m earning points while writing this post! Tim McGraw just got me a point closer to my coveted Amazon gift card. 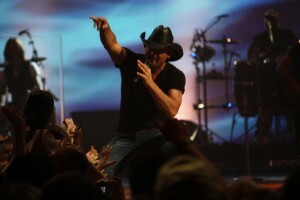 Yes, I do listen to country music. Between that and my Real Housewives post I can sense a lot of judgement coming from you all this week. If you use Swagbucks as your default search browser then you can occasionally get points just for your search. Not sure about the formula there because it’s only worked one out of the six times I’ve tried it thus far. If you’re on online game player, be sure to explore the “Play” section. You have to use Swagbucks to buy into the game, but much like gambling you might win the pot and walk away with a 100+ points. Users can also respond to surveys, answer daily polls or complete extremely arbitrary tasks to amass points. For all you coupon Queens (or Kings) you can use Swagbucks to clip coupons. Take the coupons to your local grocery store and save money on your purchase while earning 10 SBs for each coupon you use. 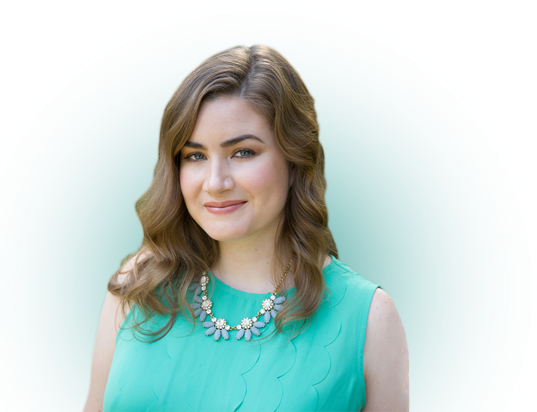 If you’re interested in signing up for Swagbucks, I will shamelessly beg of you to use my referral link – swagbucks.com/refer/BrokeMillennial – my website doesn’t like hyperlinking the link, so if you could be so kind as to copy/paste it into your browser! Thank you kind soul for helping me rack up those sweet SBs and earn the elusive Amazon gift card! Do you use Swagbucks or would you use a site like this to earn points? Be sure to follow @SwagCodezAlertz for Swagcodes. I got swagbucks but I signed up for ebates and then some online survey companies so I got too overwhelmed with the emails and the offers. I’m trying to get better about earning points with these sites as it really can turn into free money. I signed up for Ebates too, but I agree it felt like constant spam so I unsubscribed pretty quickly. Swagbucks doesn’t send me as many emails. I loved Page’s article! I was having a crummy day when I read it and her attitude 100% turned me around. Well thanks, DC! They’re pretty harmless as a site with minimal spam. I keep hearing about swagbucks, but I remain skeptical. I’ve tried similar sites and never been happy with the result. When you have your $5 amazon card in hand, I’ll be less skeptical. I can “vouch” for swagbucks. I’ve earned and used many $5 amazon gift cards. I use them to stock up on dog food and dog vitamins for our pup. I try to use the search engine daily until I win. I also do the daily survey. You won’t get rich with swagbucks, but those $5 cards add up. I know a few folks (big coupon bloggers) who have bought most of their christmas gifts using amazon gift cards. I’m glad I started on Swagbucks when I did (in 2011); the past few years have had mixed productivity, but little income. I’m trying to make money online, but it’s been a bit of a struggle. Swagbucks is one resource that allows me to make real money online. I’ve recently started optimizing my usage of it… There’s still a way to go, in doing that I think!